Ever considered signing up for Swagbucks? Before you do, check out our thorough overview of the website. In our Swagbucks review, we tackle whether or not it’s legit, speak on how it works, the rewards it has to offer, and even the benefits and downsides of using the site. This Swagbucks review will also discuss some common concerns users have about the website. These comments deal with things such as the lengthy time it takes to build up cash for a payout, the slowness of using some of their services (for example, the search engine) and even some issues with receiving the rewards. Beyond addressing these concerns, we will also be looking for any potential ways to overcome them. Headquartered in California, U.S.A., Swagbucks is a popular website based on a rewards program. You earn rewards by completing your typical, everyday web activities. This is largely similar to other websites such as InboxDollars or instaGC. A vital point to address in our Swagbucks review is whether or not this rewards website is actually legit or a scam. After going over the website and reading various user comments, we can safely say that Swagbucks is a legitimate rewards website. Joining it is completely free, and users do mention that they have received the rewards promised to them after completing specific tasks. Now, much like other reward sites, Swagbucks isn’t the go-to for creating a stable line of income. Rather, it can work to supplement any income you are already obtaining from a regular job. Web Search: You can use the Swagbucks search engine instead of your usual search engine to browse the internet. Surveys: Another way to earn points on this website is by using the Swagbucks Answers platform, which is the website’s survey pool. The amount you can earn by completing a survey varies. 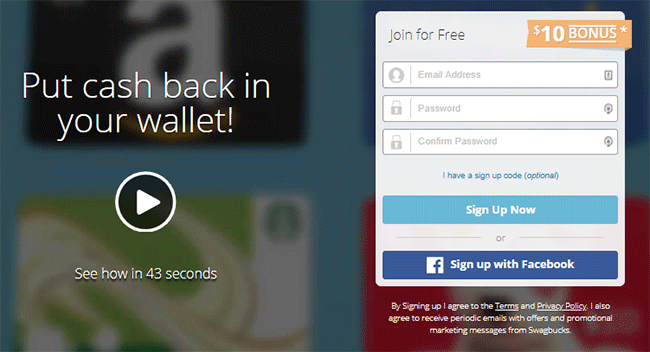 Watch Videos: This is sort of like Swagbucks’ version of YouTube. You can watch short videos, and there are also several categories to choose from. Do note that there may be a limit as to how much you can earn by doing this. Cash Back: You can gain points on Swagbucks by doing some online shopping. They reward you with an SB for every $1 you spend at featured stores and local deals. Games: Playing original games from the website can also help, as does making in-game purchases through their partners. Offers: You can find offers such as free samples from various services. When you sign up for a service, you can earn SB. Refer a Friend: If you refer a friend and they create an account and start using SB, you can earn 10% of what they collect themselves. Mobile App: You can download the Swagbucks mobile app in the Google Play Store or the App Store to earn while on-the-go. Another primary focus of this Swagbucks review is the rewards part of the website. There are not too many categories to earn from, but people do tend to seek out one section more than the others. Gift Cards: There are several gift cards that you can choose from once you have accumulated enough SB. Amazon and Wal-Mart are the most common choice of gift cards, but there are many others if you’re interested in something else. The minimum amount is $1, while there are gift cards that go to $100. Cash Payout: You can turn your SB into cash as long as you have a PayPal account. The SB can be taken out once you reach $25. From there, the denominations for withdrawing to your PayPal account are $50, $100, and $250. Swagbucks does ask that you give it between 10 to 14 business days for the payment to transfer into your account. All of these reward sites tend to come with both positives and negatives, and Swagbucks is no different. Ways to earn: There are many ways that you can earn on SB. If you are interested in surveys, then you can take surveys. However, if those have never interested you, then you can watch videos, play games, search the web, and several others. Various rewards: A good thing about Swagbucks is that you have more freedom in the type of reward you can receive. You can convert your earnings into gift cards or payout to PayPal in cash. A lot of effort for minimal SB: Although there are plenty of rewards to choose from as well as many ways to collect them, it can take a long time to actually build up enough SB to get those rewards. Some may say it isn’t entirely worth it in the end. As mentioned at the beginning of our Swagbucks review, there are some common concerns that users mention about this website. Some speak about problems getting the rewards they earned. Others are not pleased with the time it takes to gather SB and some about the slowness of using their search engine. With complications getting rewards, the best thing to do is contact the support team offered by Swagbucks. They tend to respond promptly and correct any problems you may have. In regards to the time it takes to collect SB, there is no real workaround beyond enhancing your profile so that you can get matched with more surveys. Concerning the search engine, you can try out their web extension to see if that makes it any faster. Swagbucks is also on social media, so if you cannot get through to support, you can try reaching out to them on the other platforms. Official website: You can submit a support ticket on their website to seek help with any problems you might have. Social media: Swagbucks is active on Facebook, Twitter, Instagram, and Pinterest. Mobile apps: You can download Swagbucks on Google Play or the App Store. Swagbucks is one of the many reward websites available today, but it is among the most popular ones. It offers a variety of ways to collect rewards, and you can take out your earnings in either cash or gift card form. There may be some problems with it, but users seem to have minimal complaints about the website. If you have or are already using Swagbucks, let us know in the comments and we hope this Swagbucks review helped you form a clearar picture about it!